10:13 is a one-man Instrumental Black Metal act from the United States. There isn't much history to mention about it because it is essentially brand new; "Result of an Iron Age" is the debut album and I'll be reviewing it today. I had a hard time with this review. The very first track, "Oathblade," opens with a very low-key acoustic intro which leans heavily upon a harmonica. Then the various sound clips featuring voices and Industrial noise takes over, drowning out the acoustic music as dominates the composition. I am trying very hard, but I don't hear anything about the track which suggests it is any sort of Black Metal. It has far more in common with techno club music instead. Moving on to the second track, "The Worst In Me," I find that it is a bit more tolerable. The opening is down-tempo and sounds more Metal than the previous track immediately. The pace gradually picks up with a nice series of distorted guitar riffs blending with the Industrial-sounding noise samples that are prevalent in the background. While it is similar in some small respects to "Oathblade" with regard to the underlying Industrial theme, somehow "The Worst In Me" manages to sound better; slightly more organized chaos rather than straight chaos. Both tracks 3 and 4 were better than the first track, too. Track 3, "Misanthropic Delirium" begins with a nice, heavy psychedelic tone. The music is extremely down-tuned and distorted as it flows with the organized "noise" that is part of the composition. Rather than being aggravating to listen to the track is compelling as it keeps rolling along. I'm finally beginning to see how the artist managed to get away with calling himself a Black Metal act. "Deconstructional Integrity" also features an impressive lead-in with heavy guitar riffs as well as a lot of distortion. I like the way a nice, melodic-sounding guitar solo changes to one that is more technical-sounding before it becomes acoustic. It confused me, but I wanted to know where it was going so I kept paying attention. Definitely one track that the curious should listen to. "In The Black Book of Death" starts out as something that sounds like much closer to true Black Metal; a fast, driving beat with plenty of loud, distorted guitar riffs to emphasize the point. The tempo of the song is good, too.. until it slows and has a harmonica added to it. Unfortunately, the song remains rather bogged down after that. Too bad because it began so full of promise. 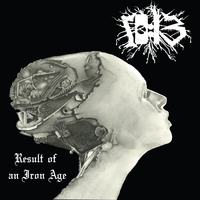 The title track, "Result of an Iron Age" is an instrumental that is really good. It features plenty of disharmony and discord to give the composition the perfect touch of dark indifference. Track seven, "Son of Monotony" is a series of background noises combined with discordant guitar riffs. I found the track to be annoying rather than engaging as a result, especially when some hard-to-name quality about the overall mix made it seem "off" somehow. "Nashiteria" did not agree with me at all. It reminded me far too much of "Oathblade"; more noise blended with different forms of noise simply for the sake of noise. "Beyond the Grip of Humanity", by surprising contrast, has a beautifully dark and brooding quality to it that manages to blend very well with the discordant riffs and samples. The composition is easy to enjoy as it follows a pattern and tone which make more sense to one's ears. By far one of the best tracks on the album! Finally, the last two tracks on the album; "A Day Too Late" and "Conduit Closing". "A Day Too Late" begins down-tempo then morphs into something even sludgier and more chaotic as it continues. There is an eerie undertone to the track that kept reminding me of old black and white horror movies for some reason. As odd as it is sounds I actually like the track quite a bit. "Conduit Closing," on the other hand, irritated me. It has an almost Jazz Fusion quality to it which cannot be diminished even with the addition of discordant guitar riffs. I did not care for it at all and cannot classify is as Metal. I honestly am a fan of some Instrumental Black Metal acts which is why I hate to admit I did not care for the album that 10:13 created. It kept reminding me of something that you would hear at a rave or perhaps at a nightclub that specializes in Industrial-themed music. Perhaps that makes me one of those annoying 'Metal Purists' that drive people so crazy, but I'm alright with owning that label in this case. "Result of an Iron Age" did not do it for me, but it might appeal to those with different taste than my own.